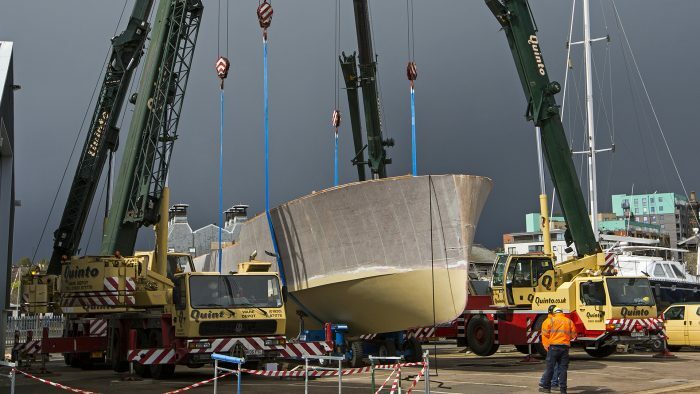 The exciting P70 motor yacht project continues to take shape in the Spirit yard in Suffolk. Work continues full steam ahead on current builds in the Spirit yard, with the spacious new P70 power yacht showcasing the range of customisation available with a Spirit Yachts’ design. We rolled over the impressive hull of the P70 in somewhat challenging weather conditions. Winds were much higher than any of us had anticipated but below the safe lift limits. It was an awe-inspiring sight to see the vast volume of the interior. Roll over is a momentous turning point in the project as it represents the start of the interior build. We are currently fitting all the major components that reside below the lower level sole including fuel tanks, stabilisers, rudder systems, engine and generator mounts. There is a huge amount of engineering to be completed before we can fit the lower floors and once this is completed we can start on the interior furnishing. In the yard, we have a pair of MAN 800hp engines and their BOSS shaft systems waiting to be installed. These with all their ancillary systems will provide the most efficient power train possible for this kind of yacht. With the ability to reach speeds of up to 25 knots, the P70 will be an impressive sight on the water. We’ll keep you updated on progress and look forward to her launch in 2018. For further details on any Spirit projects, or to arrange a visit to the yard, please contact [email protected] or phone +44 (0)1473 217 415.